New Delhi: Virtually assured of a place in the final, favourites India will leave nothing to chance and would aim to carry on their unbeaten run against lower-ranked Poland in their last round-robin match of the men's hockey Olympic qualifiers here tomorrow. With four wins out of four matches, India are more or less through to the summit clash of the tournament unless some surprising results in the last round of games hurt their cause. A draw in the final match against Poland on Friday would be enough for the hosts to secure their place in the title clash. But the Indians can't afford to take Poland lightly as a loss can jeopardise their London dreams. The men's pool in the tournament is still wide open going into the last round of matches as apart from India, Poland, France and Canada also have bright chances of making it to Sunday's final. While India is slightly better placed than their opponents in the pool and need just a draw in their last match to seal a final berth, Poland would be looking for an outright win to avoid mathematical calculations. Both Poland and France have nine points each and are ahead of the 14th-ranked Canadians in the points tally. Despite two wins and two defeats from four matches, the 14th-ranked Canadians are still in the fray for a place in the final. They will now have to beat France in their last match and hope India beat Poland. On rankings and skill, India (10th) are way ahead of the 19th-ranked Polish team but going into the match the 2000 Sydney Olympics encounter between the two sides will be still fresh in the home team's mind. At that time, it was Poland which denied India a semifinal berth after restricting them to a 1-1 draw in the league stage and the hosts would be desperate to avoid another humiliation at the hands of the same opponent. After easy outings against Singapore, Italy and France, the Indians had to work hard for the 3-2 win over Canada last night. Unlike previous matches, there were no easy goals for the Indians as the forwards found it tough to make inroads into the rival circle. They also lacked in finishing and were made to toil hard for goals by the resolute Canadian defence. 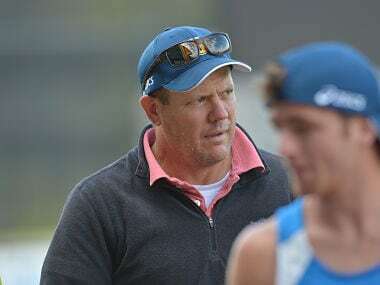 India coach Michael Nobbs also admitted that finishing remains a concern for him. "We were pushing through a little and did not finish as well as we wanted," he had said after the Canada match. There is also uncertainty over promising striker Yuvraj Walmiki's further participation in the tournament after he did not play against Canada because of a hamstring pull. But the good thing for India is that ace dragflicker Sandeep Singh and SV Sunil are in rollicking form in the tournament. After a hat-trick against France the other day, Sandeep turned out to be the hero for India against Canada, scoring two goals which took his tally in the event to nine. The backline, however, looked shaky at times and continues to remain a major worry for India. Talking about the next match, Nobbs said that he would continue with his experiments. "We would like to experiment a bit against Poland. I don't know how the match would pan out. It depends on how they play, I don't see them making the finals but of course, I can be wrong," he said.